Amenhotep III reigned for nearly four decades. His reign was marked by prosperity, political stability, and the creation of some of ancient Egypt’s most magnificent complexes. The most impressive mortuary complex in Egypt was built for Amenhotep III by the architect Amenhotep, son of Hapu. It was almost long enough to fit two aircraft carriers inside – 1,968 feet (600 meters) – while being 328 feet (100 meters) wide. Three massive gates aligned on a single axis created a long corridor that led to an immense open courtyard, and several other structures. Inside there were hundreds of sculptures and statues and depictions carved on slabs depicting Amenhotep III’s achievements. Unfortunately this temple complex was built too close to the Nile and through flooding, earthquakes, and pillaging over the centuries, most of the temple site has deteriorated. The World Monuments Fund is engaged in a project to stabilize, document, and develop a long-range conservation plan for Amenhotep’s Temple. They have already found several important artifacts buried under nearly 4,000 years of soil and river silt. Two gigantic statues of Amenhotep III gazing across the Nile remain on the site, still guarding its entrance. They were misnamed the Colossi of Memnon (an Ethiopian king and warrior) by the Greeks. 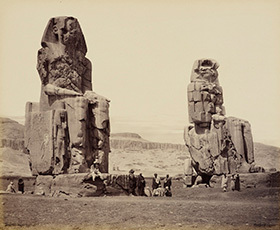 Image: Colossi of Memnon (photo taken on March 17, 1862) by Francis Bedford, from the Royal Collection Trust.